Anthony’s Park – Welcome to the Blog of Fusion Partnerships! Anthony’s Park Mobile Arts and Recycle Center is an accessible and affordable recycle based art experience which provides unique arts workshops in a variety of settings. Anthony’s Park began as a one-day holiday workshop in December 2011. It has grown into a community and recycle based arts center in Highlandtown and provides workshops throughout Baltimore and into New York. 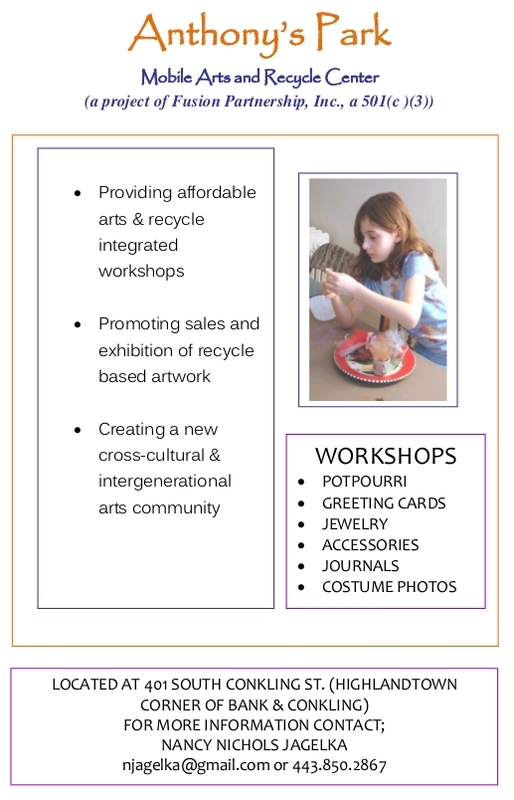 We utilize recycle materials as a creative means of communication for youth and adults of all ages. Our emphasis is also on community building through the inter-generational and cross-cultural activities that we provide. For the past two years, the center has been supported by family donations, our landlord’s patience, a small grant from the Baltimore Community Foundation, a donor who paid the electric bill and personal investments (such as thrift store finds and tax return refunds). The center recently became a project of Fusion Partnership, Inc., which enables fundraising and networking opportunities. Contact Nancy Nichols Jagelka at 443-850-2867 or njagelka@gmail.com. This is so awesome!!! Way to go, Nancy!! !